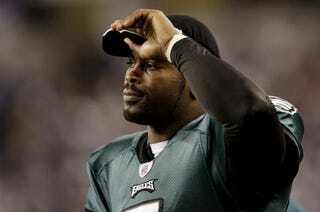 Michael Vick should have been executed for crimes against animals? EURweb is reporting that conservative pundit and self-professed Christian Tucker Carlson said, "Philadelphia Eagles quarterback Michael Vick should be executed," while filling in for Sean Hannity on the Fox Network. Of course this has to do with Carlson's disdain for President Obama's support of the embattled quarterback, who will clearly never live down the crimes that he committed against animals, despite serving time and pretty much losing everything because of it. While Vick's career and personal life are on the mend, organizations like PETA and pundits like Carlson continue to ensure that the world does not forget Vick's cruelty toward animals. As animal lovers, we get it, but being against executing an animal, yet in favor of executing humans, doesn't cut it. You can be mad at Michael Vick for what he did — in perpetuity if you want — but wishing death on someone? Not to mention, Carlson says he's a Christian and has made mistakes before. Really? It's not very Christ-like to want to kill anything or anybody for any reason. He may be one of those people who have selective morality: against abortion but for the death penalty. Carlson's antics and hateful words need no interpretation: Skewer Michael Vick, and somehow I'll become relevant again and possibly get a national show out of it. Sadly, it just might work, and that's a doggone shame.